Fall is right around the corner and so is Halloween! 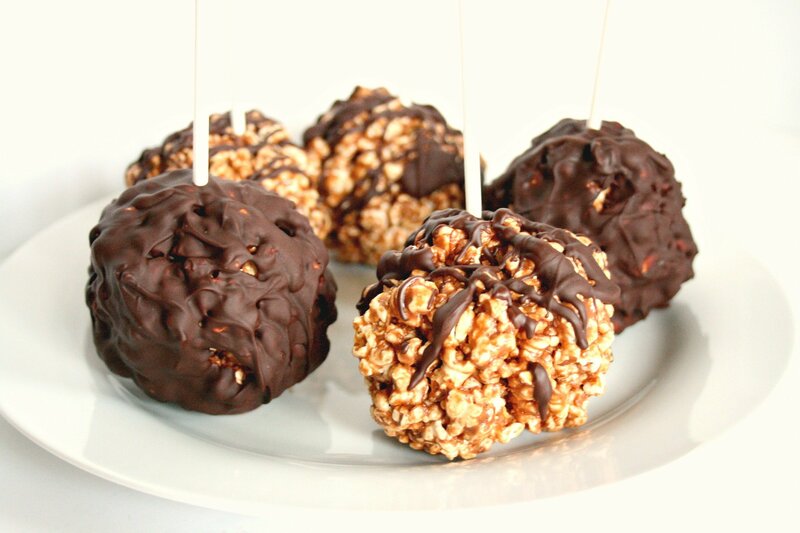 Ditch the Halloween candy for these 5 ingredient Healthy Chocolate Peanut Butter Popcorn Balls. I received samples from Pipcorn and Sprout Living. The content and opinions expressed here are all my own. One of my favorite fall treats are popcorn balls! They bring back fond memories of fall festivals and Halloween! I always loved getting popcorn balls when I went trick-or-treating. The unique Halloween candies/ treats were always my favorite. I can still remember what house would hand out the biggest candy bars, the Fun Dip, and the popcorn balls. When Pipcorn and Sprout Living asked me to create a recipe using both of their products. I immediately thought of popcorn balls. When I was younger, I loved their salty sweet crunch. As an adult, there is even more to love! My Healthy Chocolate Peanut Butter Protein Balls are packed with protein, fiber, healthy fats, and whole grains. Who knew you could get so many nutrients out of a dessert? My favorite part about this recipe is that it is so easy to make and you only need 5 ingredients. No cooking or baking necessary! Make these delicious Healthy Chocolate Peanut Butter Popcorn Balls for your fall parties, tailgating, or as a nutritious snack for your family. Don’t forget to pin the recipe for later! Simply add pipcorn, honey, peanut butter, and protein powder to a large mixing bowl. Using a spoon (or your hands) combine the mixture until it begins to stick together. You may need to add more honey for the mixture to stick together. Place the mixture in the fridge for 10-30 minutes to firm. Form the mixture into 5- 6 large popcorn balls and place on a baking sheet lined with wax paper. Place the popcorn balls back in the fridge for 30 minutes. While the popcorn balls firm, melt your chocolate. In a microwave safe bowl, melt the dark chocolate chips in 30 second intervals. 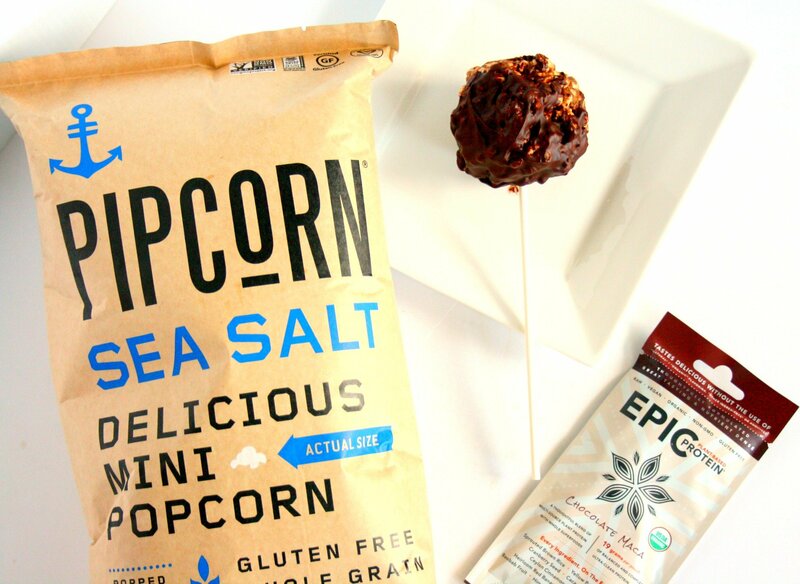 Remove the popcorn balls and insert your cake pop stick. 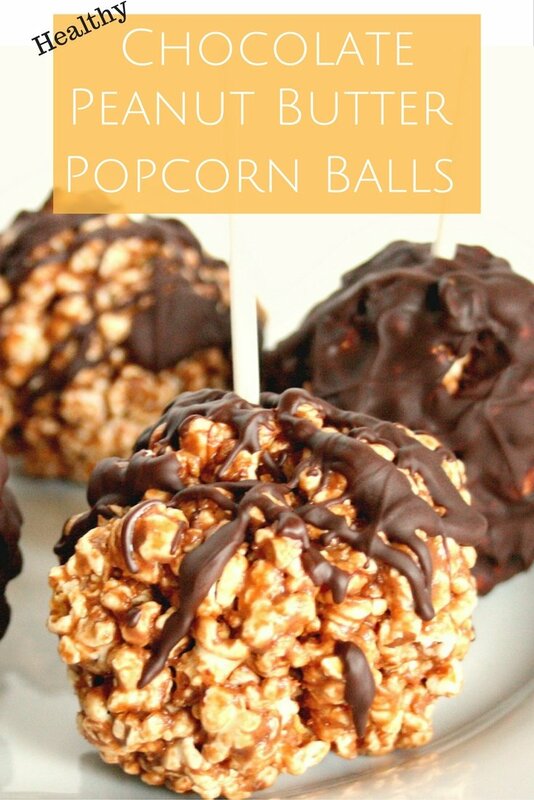 Drizzle or dip the popcorn balls in chocolate. Store the popcorn balls in the refrigerator for 3 to 5 days. Kinda sure that these chocolate peanut butter popcorn balls is a perfect recipe for my children,they will love it tho!